Malaria mosquitoes prefer to feed – and feed more – on blood from people infected with malaria. Researchers from Stockholm University, the Swedish University of Agricultural Sciences and KTH Royal Institute of Technology have discovered why. The findings can lead to new ways to fight malaria without using poisonous chemicals. The results will be published in the next issue of the journal Science. Feeding mosquitos in the laboratory at Stockholm University. Foto: Anna-Karin Landin/Stockholm University. “The malaria parasite produces a molecule, HMBPP, which stimulates the human red blood cells to release more carbon dioxide and volatile compounds with an irresistible smell to malaria mosquitoes. The mosquito also eats more blood”, says Ingrid Faye at Stockholm University. 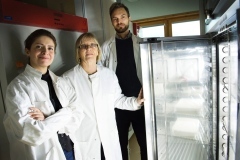 Ingrid Faye and her colleagues from the Swedish University of Agricultural Sciences and KTH Royal Institute of Technology discovered that most malaria mosquitoes, were attracted by HMBPP-blood, even at very low concentrations. The mosquitoes are also attracted more quickly and drink more blood. Moreover, these mosquitoes acquire a more severe malaria infection, i.e. higher numbers of parasites are produced. This indicates that the extra nutrients from the larger meal of blood are used to produce more parasites, researchers believe. Neither humans nor mosquitoes use HMBPP themselves, but the parasite needs the substance to be able to grow. The research team at Stockholm University. Noushin Emami, Ingrid Faye and Bo G Lindberg. Photo: Anna-Karin Landin/Stockholm University. “HMBPP is a way for the malaria parasite to hail a cab, a mosquito, and successfully transfer to the next host”, Noushin Emami explains. She has worked over three years in the project and has performed a large part of the complicated practical work with the parasites and the mosquitoes at Stockholm University and at the Swedish University of Agricultural Sciences in Alnarp. “This seems to be a well-functioning system, developed over millions of years, which means that the malaria parasite can survive and spread to more people without killing the hosts”, says Ingrid Faye at Stockholm University. These results may be useful in combatting malaria. Today the most efficient way is to use mosquito nets and insecticides to prevent people being bitten. Resistance against the insecticides require new control methods to be developed to tackle the mosquitoes. In addition, medicines, even the drug awarded with the 2015 Nobel Prize, become progressively inefficient when the parasite becomes resistant to them and new drugs must be developed constantly. A vaccine seems far away, Ingrid Faye says. A major step forward in the fight against malaria would be to create a trap that uses the parasite’s own system for attracting malaria mosquitoes. 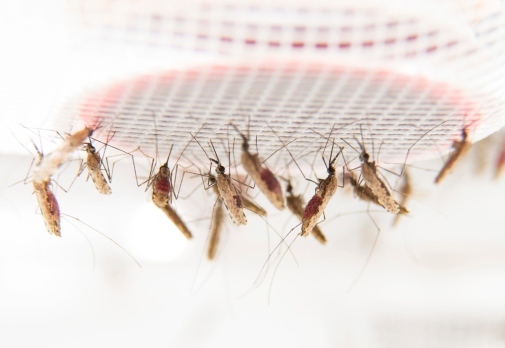 Read more in the article “A key malaria metabolite modulates vector blood seeking, feeding and susceptibility to infection”, Science online. Malaria is one of the world’s most common and serious diseases. It is caused by unicellular parasites spread by some mosquitoes. Every year about 430 000 people die from malaria, most of them children in Africa. About 200 million new malaria cases occur annually.